So I got the eye bolts in and was wrapping the harnesses around the harness bar. The angle looks to be right around 45 degrees though...if I run the harnesses all the way back, can I mount them to eye bolts in the trunk wall? Is that going to be too flexible? 45 degrees sounds unlikely unless your seat is mounted really high. Post a pic. Seats aren't that high. I am 6'1 and can sit in them with a helmet on with plenty of room. I even tried putting the seats on the floor and the angle was still fairly severe. That does not look safe. The right way to rectify would be to have a harness bar added to the roll bar at the proper height. Going back several feet to the rear firewall would worse than the current situation. It’s definitely not safe, that’s why I didn’t finish putting everything in. And I don’t see how going to the firewall is less safe so long as the metal will hold. The scrosch instructions as wel as dis says you can install harnesses greater then 20” away so long as you cross the harnesses. Am I missing something? The rear bulkhead or parcel shelf is not strong enough or thick enough for that kind of load. I've done it, but don't recommend it. Agree, this issue is with the roll bar and the best fix is adding another harness bar higher up. I think this would be ok, but still need to mock something up and make sure I like the seating position. If that doesn't work, I have ideas for reinforcing the trunk firewall. one of my buddies has a plasma table and I am sure I can come up with some reinforcement plates that could be welded in place. Even if the rear shelf was strong enough, it is not advisable to mount the belts so far behind the seat. Also, you need to sit in the seat and see where the belts are coming off your shoulders, not necessarily only where they are pass through the seat openings. Those openings look very short, so hopefully they align well with your shoulders and the opening doesn't modify the belt angle. This is an older pic, but essentially shows where I sit in the seat. 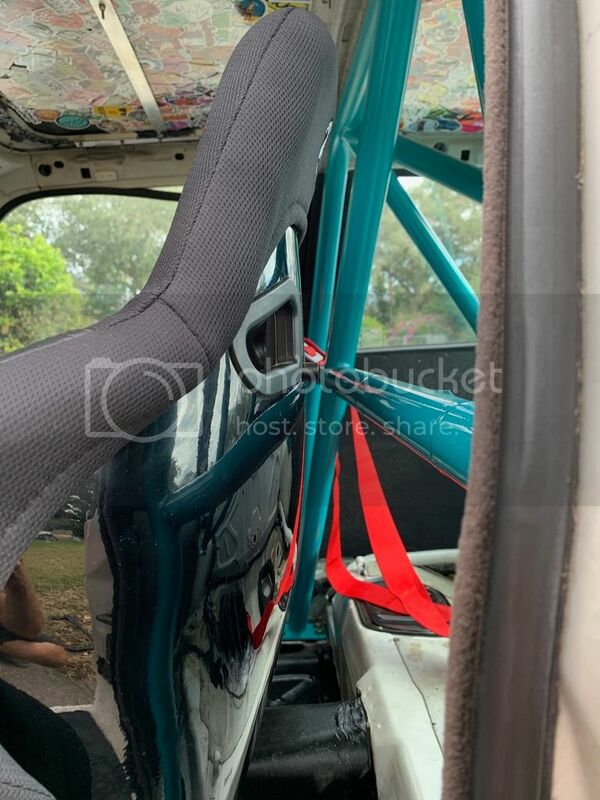 Even if the rear shelf was strong enough, it is not advisable to mount the belts so far behind the seat..
FWIW, all the Gruppe A E30M3s had their belts mounted to the rear package tray. The Matter cages do not come with a "harness bar", thats pretty much a 'merican car racin' thing. Much like the "Seat Back Brace". CAVEAT: The Matter shells had extensive reinforcing on the rear package tray specifically for the belt attachment points. All that said, I feel no less safe in my Gruppe A car with the belts mounted to the package tray , than I do in my club racer with them on a more conventional harness bar in the cage. The angle is more important than the location. If you cannot get your seat low enough to get the angle correct with your current roll bar cross bar,,, AND,,, the rules of your sanctioning body allow,,,, AND,,, you do the necessary reinforcing I personally wouldn't hesitate to go to the rear bulkhead. Last edited by JimmyP; 01-14-2019 at 12:00 PM. Safety equipment has changed a lot in the last 30 years. While cool, I would never build my roll cage to mimic the E30 M3 race cars of yester-year. That said, Schroth does allow for far-back mounting like that. 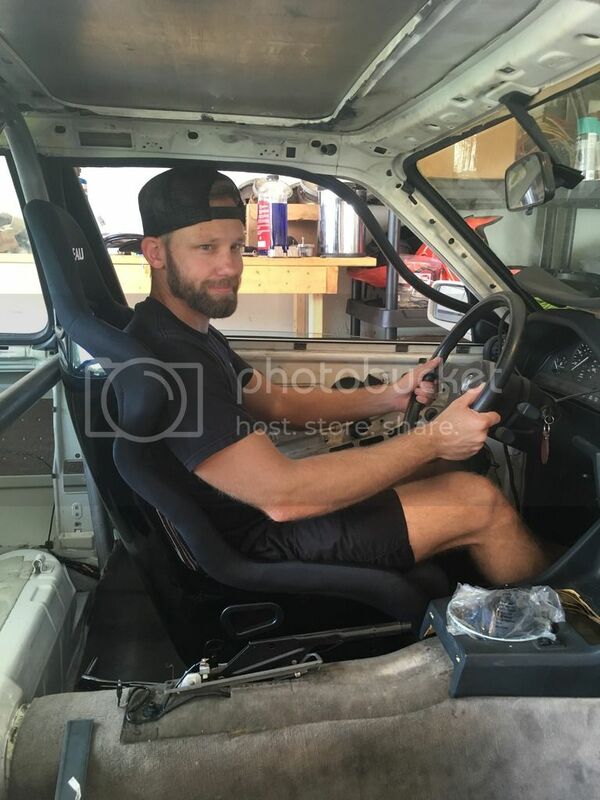 Of course, he is not using Schroth harnesses, so who knows what the other manufacturer approves/allows for since they didn't come with instructions. The Matter cage design for the E30, is still the foundation of the best cage design for the E30 chassis. I have yet to see in the past 30 years any E30 cage design that significantly improved on the Matter E30M3 cage. Other than people adding a few fancy modern looking roll punched tin gussets, or an odd vertical bar in the door opening (making it really hard to get in and out), the Matter E30 design is still the best foundation to start any E30 cage from. Please expand on the E30 cage design that you find superior for the E30? The Matter Evo cage looks like a good starting point. I personally would add a NASCAR door bar on the driver's side, a harness bar on the main hoop, and at least 1 diagonal bar in the main hoop. That is based on my personal experience/preference and from following the current NASA and SCCA rulebooks. I am not an engineer or a race professional. It was the 6pt Matter design with the single diagonal door bar that I was picturing in my mind as something I would avoid personally. Mainly the door bars, and not having a harness bar or diagonal on the main hoop. I would not want my harnesses mounted on the rear firewall, as most modern belts and HANS devices aren't designed to work in that manner, as far as I can tell. Just my $0.02. I know you have much more real-world experience than I do, Jimmy. Last edited by Digitalwave; 01-14-2019 at 12:27 PM. Just to clarify, the only thing I ever refer to as an E30M3 Matter cage is the Gruppe A cage that is welded in to the factory Gruppe A chassis. Attached to the front strut towers, the rear shock towers and picks up the rear diff and subframe. They evolved a bit over the run of the E30M3 in competition (early versions had single door bars) late versions for the DTM92 cars had a 2nd rear hoop. I'm not aware of any Matter 6 point version. The Gruppe N cars were restricted to a basic 6 point style cage (I think Gruppe N was even restricted to bolt in only) but I was not aware that Matter had involvement in the Gruppe N cars. Maybe they did. Whenever people discuss the Matter E30 cage they are 99% of the time referring to the Gruppe A welded cage which attached to the chassis at 11 main points, plus was installed close enough to be welded to the body structure at numerous other points. Its a beautiful cage, as I said I think (my opinion) its never been significantly improved on in the past 30 years since.